July 2016 Archives - Newman Dignan & Sheerar, Inc. - Providence Fee-Based Financial Advisors July 2016 Archives - Newman Dignan & Sheerar, Inc. Despite some mid-week challenges, the market closed the week with its 5th straight advance, with the S&P increasing by 0.6% and the Nasdaq by 1.4%. Post-Brexit uncertainty, recurring Fed debate [which produced a stronger dollar] and falling second quarter earnings [~25% of the reports are in, reporting a blended 3.6% decline] all buffeted financial markets. Finally, this Wednesday’s release of the Fed’s July Policy Statement will attract more than its fair share of attention this week. The Fed has been playing Lucy with Charlie Brown’s football for several years now, but it is now apparent that the Fed wants to raise rates without tightening. Their “success” will be measured by a Fed funds increase not accompanied by an upward move in the Treasury yield curve as well as not producing any incremental dollar strength [this will be difficult]. Last week, equity markets continued their advance led by international stocks. For the week, the MSCI EAFE index was up 3.66% while the MSCI Emerging Market index increased 4.85%. In the U.S., the DJIA was up 2.04% while the S&P 500 increased 1.51%. Small caps as measured by the Russell 2000 finished up 2.39% for the week. Bonds declined as interest rates rose for the first time in several weeks. The 10 year U.S. Treasury rate went from 1.37% to 1.6% as the U.S. Bond Aggregate index declined 0.78% for the week. Cyclical sectors still lag defensives YTD, but recent economic news suggests that investor optimism is improving. Post Brexit, cyclical sector stocks in the U.S. are up 9.2% vs 5.9% for defensive stocks. Economic reports last week were generally positive as retail sales increased by 0.6% m/m, PPI improved 0.5% m/m, and CPI showed a 0.2% increase in June. Even though earnings expectations for the second quarter are expected to decline, headwinds from the stronger dollar and oil prices are starting to fade. Cyclical sectors may have some tailwinds moving forward. 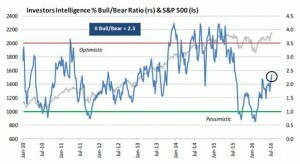 Market sentiment this week should be dictated mostly by company earnings and guidance. This week, 88 companies in the S&P500 are set to report. Equity markets finished in the green last week as June’s job report was much better than expected at 287,000 new jobs. This follows May’s dismal showing of only 11,000 new jobs. U.S. markets are now closing in on all-time highs … just at a time when investors feel like there is no hope for markets to go higher. For the week, the DJIA finished higher by 1.12% while the broader-based S&P500 gained 1.33%. International markets continue to struggle as the EAFE Index lost 1.74% for the week. Fixed income, represented by the Barclays Aggregate, finished the week higher by 0.60%. As a result, the 10 YR US Treasury closed at a yield of 1.37% (down 9 bps from the previous week’s closing yield of 1.46%). In addition to the jobs report, last week saw a number of economic releases. New orders for U.S. factory goods fell 1.0% in May following a 1.8% gain in April … some experts are indicating that a bottom may be in place for manufacturing. On the other hand, June’s U.S. non-manufacturing rose more than expected to 56.5 from 52.9 in May. We expect volatility to remain high as investors digest conflicting economic and political news. As always, we plan to look through the day-to-day news and focus on longer-term objectives. Lastly, our hearts and prayers go out to the entire Dallas community after last week’s tragic events. We wish everyone PEACE. The global markets rebounded last week, recovering from the “Brexit” induced sell-off that carried into Monday. The S&P 500, NASDAQ, and Dow Industrials all gained over 3% for the week. International equities also recovered nicely with the MSCI EAFE rising 3.48% and MSCI EM gaining 4.5%. Brexit certainly shocked the global equity markets which experienced the highest one-day sell off in history ($2.08 trillion) the day after the UK vote. Investors were able to breathe a sigh of relief with last week’s rally, which was supported by the Bank of England signaling further monetary easing and the price of oil rising during the equity market’s decline. Oil has surged 26% during the last three months, its largest quarterly gain since 2009. US economists are still concerned about the flattening yield curve with both the 10 year and 30 year Treasury yields touching record lows. The current yield of the 30Yr Treasury is 2.19% while the 10 year is 1.38%. These tightly narrowing spreads tend to indicate sluggish economic growth going forward. Thirty-one out of thirty-three banks passed the 2nd round of the Fed’s annual stress tests, allowing the banks that passed to commence share buy-backs and to increase dividends. Buyer beware, bank interest rate margins are being squeezed with rates at all time lows. Lower margins will weigh heavily on earnings. All eyes will be on second quarter earnings and guidance along with this week’s June employment report.